Other than requiring that players play with consideration for the safety of others, that is responsibly and not wildly or recklessly, there is little else that can be done to prevent accidental injury caused by the ball. But playing responsibly is not a little, it is a lot and requires skill (stick and ball control) and self-control. It always causes outrage when it is suggested that a spectacular goal should have been disallowed. But this shot (below) caused legitimate evasive action by two defenders on its flight path – either of them could have been badly injured by it, (the player closer to the goal could have been killed) and it should have been penalised as dangerous play. The attacker who was obviously careless of who was in front of him and with the circle crowded with players, (deliberately) raised the ball high towards the goal with the hardest edge-hit he could make. Below, another reckless shot. The attacker had time and space to make an alternative shot and even to pass the ball to a team-make near the right-hand goal-post, but choose instead to raise the ball with an edge-hit towards the goal and ‘through’ a defender directly in front of his position. Here below the shooter ‘targets’ the head of the post defender. Don’t believe it? You ought to, it’s a coached tactic. It’s not a coincidence that it happens so often. Legitimate evasive action taken and ignored, goal awarded – ‘accepted’ umpiring. There is no good reason why a drag-flick shot made towards a defending opponent should not be height limited. A suitable height may be sternum height, which is about 120cms on a standing male senior (that is about head height when this player is in a dribbling crouch). This height could easily and cheaply be marked on a goal with an elasticated tape which would be readily adjusted to 110cms for women and 100cms for juniors. There is no need to limit the height of any flick shot that is not made towards an opponent. i.e. a shot that cannot cause legitimate evasive action. 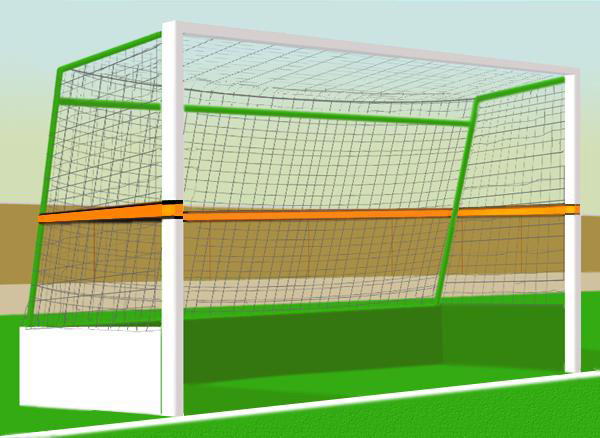 Goal with adjustable height limit tape. .The intention of the attacker in the incident below was I think to propel the ball towards the forward close to the goal, for a hit or deflection into the goal. The defender seeing that possibility moved out to mark the attacker and had no chance to avoid being hit with the ball, which came at him on a high path he did not expect. I don’t know how the match was restarted, but a bully seems appropriate, neither player committed an offence. This incident below shows a similar tactic but performed in a different (and illegal) way. The IND shooter uses a hard forehand edge hit (an action which is specifically prohibited) to raise the ball towards his team-mate . The second IND player then deflects the ball up into the body of the CAN defender – which was a dangerous play offence. The umpire awarded a penalty corner – of course, the ball hit a defender in the body. I have dozens of video clips which show a player raising the ball towards an opponent, often intentionally sometimes not. I chose the one below because the stroke used to propel the ball is not clear (the frame rate of the original video did not catch much of the movement of the stick). Why chose a clip where the stroke used is not clear? Because it does not much matter what stroke is used if the ball is raised and other criteria are also breached (and intention will also be irrelevant if the player hit is within 5m). Raising the ball towards another player, with any stroke, intentionally or not, is an offence if doing so causes that player to take legitimate evasive action (action to try to avoid being hit with the ball). There is no distance advice given with legitimate evasive action so such evasion is valid (legitimate) at any distance where the evading player has reason to fear that he or she will be hurt if hit with the ball; a typical situation would be a ball raised towards a goal when defenders are positioned between the goal and the player propelling the ball – a drag-flick during a penalty corner for example. The commonly held view that defenders who are positioned between a shooter and the goal are “Asking for it” and should not be there, is no more than an erroneous view held by those who are ignorant of the Rules of the game (the oft quoted “Acceptance of Risk” does not (cannot) apply where the actions of an opponent endanger a player and are not Rule compliant. All players are entitled to expect the protection from endangerment provided by the correct application and proper observance of the Rules). Try to avoid doing what you see FIH Umpires doing in these situations, they are following briefings, not the Rules of Hockey. They follow briefings, which are intended to ensure that all umpires are making the same decisions consistently – (therefore ignoring the relevant subjective criteria in each incident). They have, by previous similar decisions, trained players to expect them to keep umpiring in the same way and then, using circular reasoning, use this ‘player expectation’ as a justification for the decisions they make. Being consistently incorrect is not seen as a fault but as the acceptable cost of consistency – it is easier and expected that an umpire penalise a player who has been hit with the ball. The fact that is may also be absurdly unfair is irrelevant. “That’s the way it is interpreted” is a ‘stone wall’ of indifference to fair play. It is ironic that a match umpire is the sole judge of fair play. I have to ask ‘the interpretation’ of what? What wording is being interpreted in a way that is the opposite of a common sense literal interpretation of the words used in the Rules of Hockey? There isn’t any other wording. If it’s not interpretation of actions based on the wording of the relevant Rules or a reasonable interpretation of the words used in the Rules, and it isn’t, it cannot be, then how did this interpretation (invention) arise? Listen to the commentator in the following video explaining an ‘interpretation’ – which I hope is now ‘dead’ but was the prevailing one for some time after this initial incident in which it was applied, during the 2008 Beijing Olympics. (I have no idea where the commentator got the ‘interpretation’ he was ‘quoting’ (???) but it fits with bizarre commentary on other matches which he has irresponsibly broadcast). Did the commentator invent it or was he given instruction (a Rule briefing) by an FIH official (an Umpire Manager or Tournament Director)? Maybe, like many umpires, he followed the briefing he was given without knowing or considering (caring) whether or not it was Rule compliant, the main thing with umpires (and commentators) is to be ‘in the group’, ‘ to go with the flow’, not ‘to rock the boat’ to ensure that he him/her-self is ‘accepted’ and asked to umpire (commentate) at a high level event again. This award of a penalty stroke seems to follow the above “Cannot be dangerous” ‘interpretation’, but the shot clearly endangers two players. This incident from the 2018 Women’s World Cup is as bad a the one shown above. The ball was raised into the Japanese player at considerably above knee height (it hit the crouching defender on the collarbone) and from well within 5m. Clearly a dangerous play offence yet a penalty stroke was awarded. It difficult to see what possible advantage the Japanes player was supposed to have gained (not that that is important, when there is prior dangerous play any gain of advantage for the team of the player hit with the ball becomes irrelevant, the dangerous play must be penalised. This incident resulted in an award of a penalty stroke to the New Zealand team: an example of umpire ‘brain fade’. The next two clips show examples of a player in possession of the ball raising it into a close opponent – in the first with a flick, an action which is specified in the Explanation to Rule 9.9 as dangerous play. In the second with an intentionally raised hit – directly contrary to Rule 9.9. In both incidents the player hit with the ball was penalised. The two incidents below show a similar action at different levels of play – a drag-flick raised high into an out-runner during a penalty corner. The AUS international player was hit on the upper arm just below his shoulder. Had he been hit below the knee, as a Dutch attacker claimed he was, another penalty corner would by Rule have been mandatory – an absurd contradiction of dangerous play as described in the Explanation given with Rule 9.9. I am not claiming the current Rules are perfect – very far from it. I want to change them all – a hit that is raised into an opponent within 5m should also be declared in Rule to be dangerous play. At the moment penalising that action depends on the judgement of intent (of the shooter) and of legitimate evasive action – both subjective judgements. I have no idea what the offence, which was penalised with a penalty corner, the veteran out-runner in the second incident was supposed to have committed. The offence by the shooter is clear – but the umpire instantly awarded a penalty corner, rather than stopping time to check on the injured defender.